Phil Barrett is an acclaimed and respected Irish cartoonist, who returned from Canada a few years ago with a style hybridised from the best of both country’s cartoonists. Readers of The Black Panel Diaries series are familiar with my ravings about the great sales of his work at Belfast markets. Over email, Phil tells me this approach has already outsold his online sales this year. Oh, and everyone else loves his gear too. Paddy (Brown) suspects the reason many people pick up your books is the quality line and brush-work. For people who have never picked up a Phil Barrett book, could you please give a brief description of why they might? 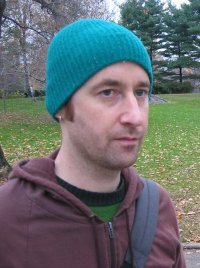 Phil Barrett: Ultimately I suppose I’m trying to create an intriguing story to keep the hypothetical reader reading even if they have no clue as to where it might be leading. After you’ve read one of the stories you should kind of know what I’m getting at with the ideas therein but not quite be able to put it into words. Most of the stories are an elaborately constructed set made to look like a blind alley. Hopefully everything else from the artwork to the presentation should serve this end. AL: Could you tell me about your own experiences selling at comics markets and community fairs? PB: In my experience selling my own books at fairs and so on has been something of a revelatory missing link. Previously I’d just distributed my comics as best I could via comic shops and other similar shop based outlets where you dropped off a few copies sale-or-return and hoped for the best (often hanging about the shop to see if anyone ever picked them up). There is something thrilling about witnessing the public handing over money for your books – ‘There are real people reading these things!’ When you put so much into their construction, the pride and satisfaction of seeing them go off the table and out the door is not to be overrated. Also you get to meet other cartoonists doing the same thing. Cartooning can be a lonely oul game and the camaraderie and healthy competition is a good boost. The Black Panel distribution table is an excellent outlet and straddles the best aspects of the comic shop and community fair – an open-minded but not necessarily comics-savvy crowd looking for something original – what could be better? AL: Is there any chance we’ll have you over at the Black Panel for a signing this year to meet your adoring masses? PB: ‘Adoring masses’!?! I think you mean a non-repulsed handful! Once I get something new together to shill – I’ll definitely be up. AL: What are you working on at present and when can we expect to see your next print comic? PB: At the minute I’m finishing up some new material for a collection of short pieces that the publishing arm of the Verbal Arts Centre in Derry are going to put out. Hopefully that should be done for mid-May in time for the Bristol Expo. There should also be a self published mini-comic ‘Ricky’ before the end of May – rejigged from a previous anthology appearance. 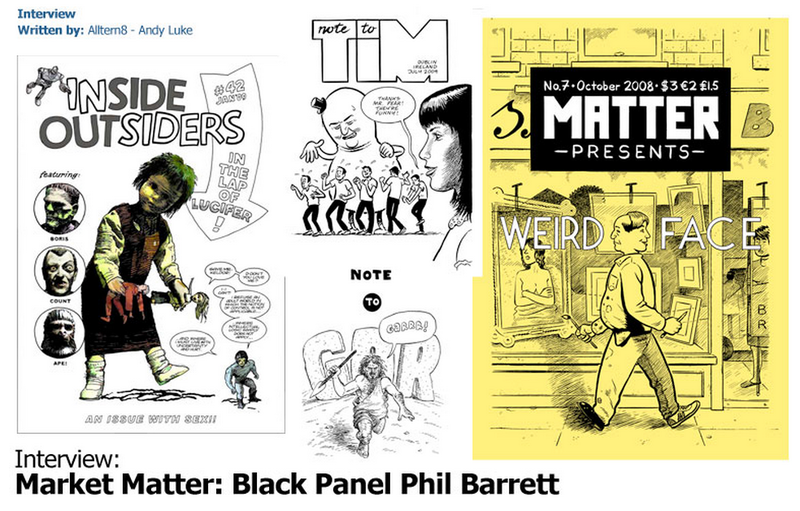 AL: If a reader had only to pick up one Phil Barrett comic do you have one you’d be most proud of? PB: The Matter blue one ‘Stagnant Pool’ is probably the one I’m most happy with. Even though its a good few years old at this stage it’s probably the one comic I’ve done so far where the potential at the time was fully reached – it doesn’t read as if I wrote it at all! Plus it’s funny in parts. ‘Blackshapes’ is also worth a gawk though it came out a bit more serious than me. AL: And readers of your work might also enjoy which comics by other artists? PB: I would have no doubt those readers would probably enjoy any other homegrown comics available on the Black Panel table – I think they share the slightly mordant humour and surreal worldview of much of the Irish output. AL: What sort of print runs do your comics usually have and how often do you go back to press? PB: Unfortunately I’ve never kept accurate figures. I usually print at home on demand and at the moment it’s wholly through fairs and markets and the odd internet order that the comics are distributed. Since it’s been around the longest, the Matter Blue one is probably the bestseller at what I’d estimate at 400+. AL: You seem to be quite good at selecting disparate images in your comics narratives. (Especially in the blue-covered Matter: A Stagnant Pool) What advice would you give to the kids who want to make a name for themselves as comix storytellers? PB: Focus on the storytelling more than the comix. It’s the story that people respond to – once they get past the surface of the artwork it’s the story that keeps them reading. It’s worth spending as much time tweaking and honing the story and how it flows as it is on the more obvious return of polishing the artwork. Keep a sketchbook and use it – ideas disappear as quickly as they appear unless they are noted down. The ‘stagnant pool’ story is practically a jigsaw patchwork of image ideas tacked together. The Black Panel Diaries season continues over the next month at Alltern8, covering the 2D Festival in Derry and The Point Village Festival in Dublin. Phil Barrett will be appearing as a guest at both of these events.